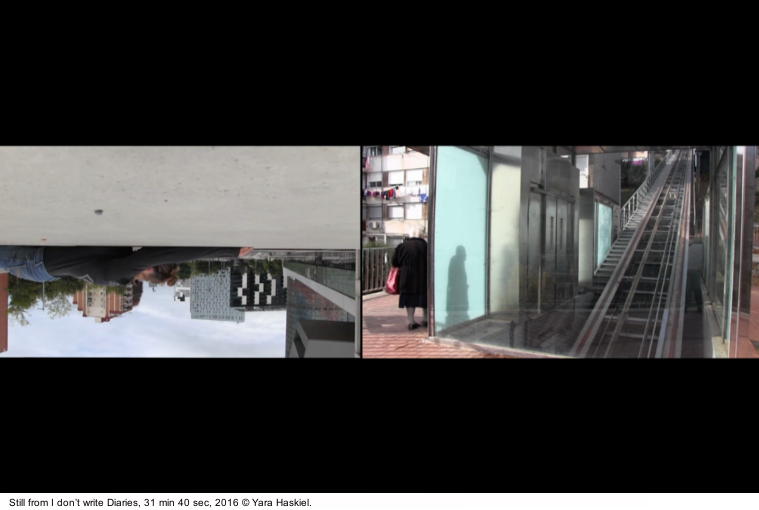 Yara Haskiel is a video artist and researcher. She studied Experimental Film and Art and Media at the University of Arts in Berlin and Hamburg. She holds a Master in Museology and Critical Theory from the University Autonoma, Barcelona. In 2014/5 she was part of the Independent Studies Program (PEI) at the Museum for Contemporary Art (MACBA) in Barcelona. 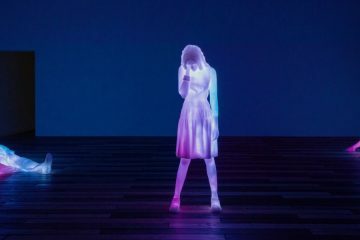 The connections between memory and (dis-) placement of minor and forgotten narratives and their social effects are central themes in her work. Further she focusses on mourning and the effects of precarity connected to love from a feminist perspective. 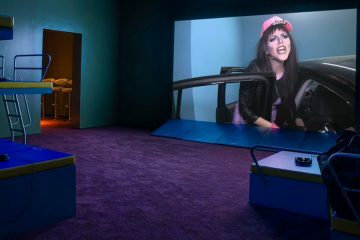 She is experimenting with mobile cameras, found footage and new media in her video essays, multi-screen installations and performative formats. 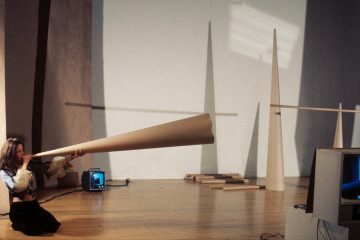 This interview focuses on her two more recent long video works. Tsakalos Blues (2014, 65 min.) and the two-channel work made out of: I don’t write Diaries I: On Love and Crisis and I don’t write Diaries II: On the Power of Fragility (2016). 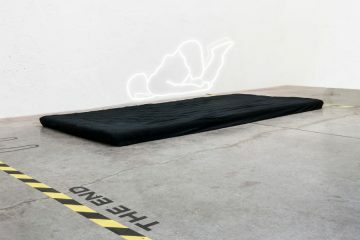 The first was part of the group exhibition Personal Geographies she curated and organized together with Branka Vujanovic and in collaboration with the artists Angelika Levi, Angela Melitopoulos, Andrea Bellu and Matei Bellu, at CIAT – Contemporary Institute for Art & Thought (2016), while the second was shown at the Kunsthalle am Hamburger Platz as part of the group exhibition and symposium un-stable.eu (2016). In Tsakalos Blues (tsakalos is the Greek word for “rascal”) part of the footage she makes use of looks much older than the work itself. Since the subject is a very personal one, strictly related to the history of your family, it seems the artist has been using old material of yours, even from before your studies, shot already with the idea to deal with her family’s past and present. 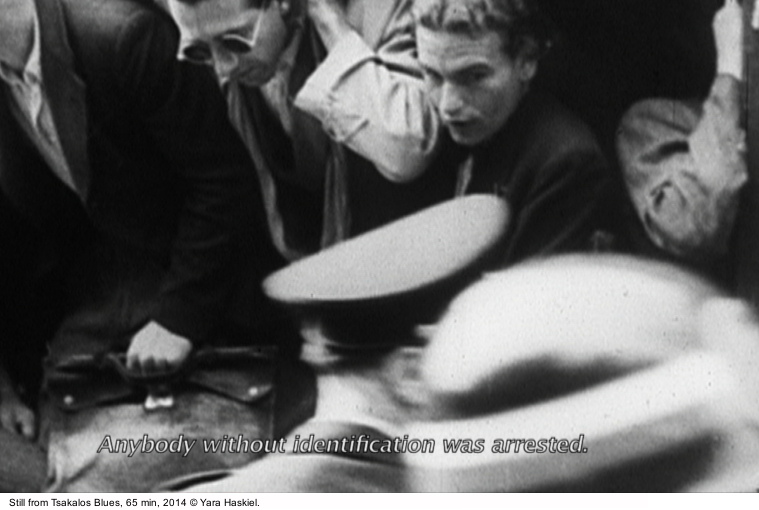 Mario Margani: It seems to me in some passages that you at first needed to document what you were doing with your father more generally, and that you decided to use this material for the film only later. Where you at that time already into studying video at the academy or you where more learning it on your own? Yara Haskiel: The first time I started to work with video was when I was seventeen or eighteen while I was living in a communal housing project, back then I made an internship at WIM – Werkstatt für interkulturelle Medienarbeit e.V. Berlin. It is an association for media based mediation and documentary projects that follows somehow a tradition in Germany. Mainly documentary filmmakers from the ‘68 and post ‘68 movements founded it. There I was learning and making my first experiences with editing. I didn’t hold a degree to attend universities. So after that I made a two-years media design school and then 2005 I started assisting Angela Melitopoulos in Cologne. Simultaneously I did applications for art schools and started to work on my first middle length video Tsakalos Blues. I had seen Melitopoulos Passing Drama (1999), which dealt with her Greek father, who was a forced worker in Vienna and with the story of the diaspora of her family (the Asia Minor Catastrophe). I was deeply moved by that, or maybe even psychologically pushed, and I started to make this film about my father. It took me all the time of my studies, so basically I continued to work on it for around seven years. I was recording with my father, and the material you refer to – that it looks even older – it’s actually Super8. Mario Margani: So you didn’t make use at all of archive pictures and footage taken by your father or by other family members and friends? 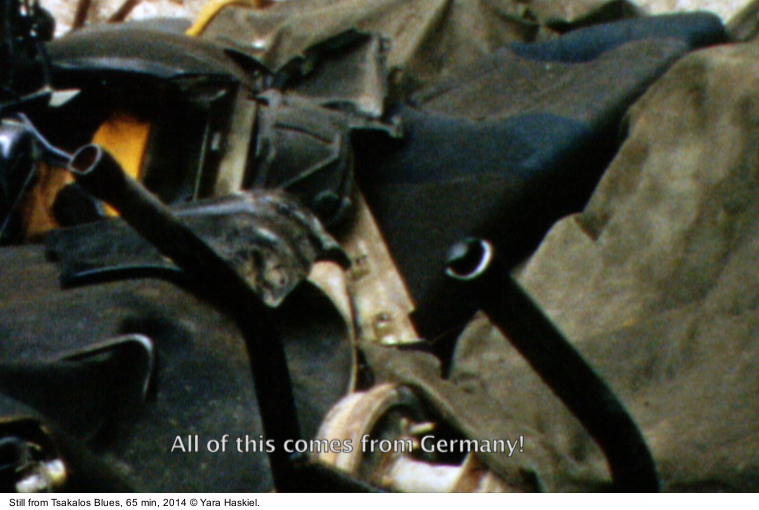 Yara Haskiel: It sounds super that you thought of that, because exactly that was the idea behind me using Super8. It was the idea and need to create a family’s diary that does not exist actually, because our family didn’t have any access to Super8. We just had photographs. For me to use Super8 was a way to create an imaginary layer for the diary of my father, or my grandfather even. Mario Margani: The trip you made with your father from Germany to Greece was also a way to rewrite, or write for the first time, a sort of diary with him, telling his life situations as a kid and up to now. Yara Haskiel: I tried to imagine the Super8 as the kind of material that he might have use if he would have had the chance to film. However, at that time the access to Super8 was restricted to wealthy families. Mario Margani: In Tsakalos Blues the difference in dealing with the past of your family turns out to be clear, between your will to know more also about painful times, and the way your father answers to you about a topic which was merely a taboo up to that time: the events and different moments in the life of your grand-father being deported from Greece to Poland in a forced labour camp (at the concentration camp in Auschwitz), and his life after that. Despite this, your father seems much more open than your uncle in speaking about these topics. On the other hand the members of another family with a parallel history being interviewed by you had a totally different approach, also due to the fact that their father, who was friends with your grandfather, wanted to tell and discuss extensively, maybe even compulsively, about his experience in the death camps in Poland and Germany. His sons were overwhelmed by these stories, which also produced a different approach between the two brothers you met. But they both have a different take and reception of the whole story if compared to your father’s one, with whom after all they shared much time in their youth. Thanks to Tsakalos Blues you have been able to break some taboos in your family. Your father anyway seems to have been open for that, since you have been “writing” his diaries during your journey together, while your uncle seems to be less willing to talk about that or about the consequences on his own life afterwards. When your father refers to him he says that he has an inferiority complex, because he never got a proper job or built up a proper family. All these different approaches come up with more evidence during the shooting, or was it your idea from the beginning to try to highlight them? The way in which such a history is told, or not told at all, changes and shapes the life also of further generations to come. Did you feel attracted by the way the other family dealt and deals with their past? Did you wish that your family had done the same? 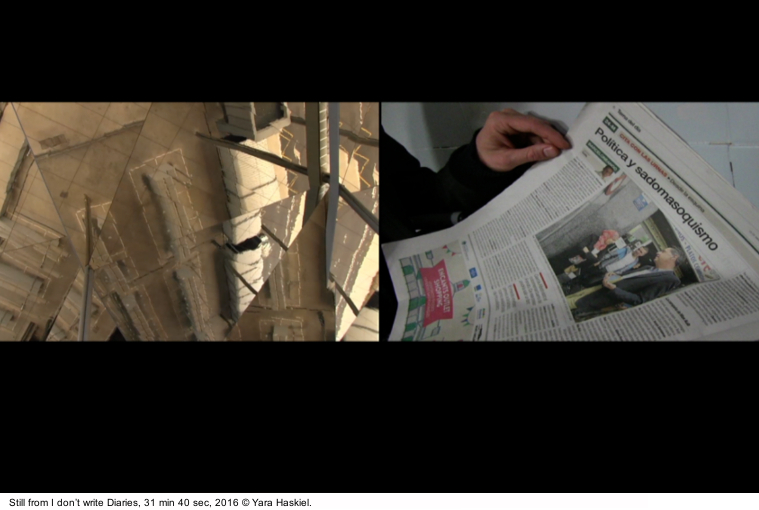 Yara Haskiel: It was very interesting, but it is not such a clear difference. Also there is a sequence in the movie where one of the two brothers of the Parente family, which is the family you are referring to, tells that his father has always been talking to him about the camps, and that he was “biting his hears”, meaning that he was overwhelmed, while the younger brother, the one sitting in front of the wheels shop, says that his father never talked about that. So they also had contradictory experiences. But it was very interesting to meet them, because they were childhood friends of my father and uncle, and because they had such a proud way of talking about their father, what he had experienced and how. They have a very clear Jewish identity. Their way of expressing themselves particularly attracted me, because of course they had a very clear and direct articulation, and they very beautiful in that way. So for me it was a way to try to grasp this dramatic experience that was transferred onto the next generations, but then also about how it does get articulated into story telling or into the language somehow. And how fragmented this language can be, because in these gaps you can also find things that are somehow not the gaps that actually existed in the narrations of the parents. Starting this process has been a painful experience for my father and my uncle because they had to travel back in the past and rethink everything. They had to draw themselves back into painful stories that produced rejections and discomfort. Mario Margani: But this can reflect also an issue they have with their identities. I wonder if that was an outcome or a cause of a struggle with your own identity and with an uprooting experience. Maybe you found a mirroring of a clear identity in the Parente family. They live in Greece. They have their own Jewish identity and their own way of talking about the past and dealing with that. The problem of the statelessness of your grandfather makes the things even more complicated. This fragility of not having a clear, official and linear identity also shapes changes and the development in the years of your father’s youth. Instability and other vulnerabilities they didn’t want to discuss deeply. And through him it touches you. Yara Haskiel: I think also there are some major differences. The survivors of the forced labour camps who came back to Greece have been maybe 1000-1200 people, which is not a lot. They of course re-entered their local Jewish community and they were holding on to each other. But when they came back there was a kind of misunderstanding, which is common to most of the survivors of the Shoah who came back to their countries. Nobody believed the stories of the ones who arrived first and there was not so much knowledge created about what they experienced. They came back and re-joined a community, even if it was very small and fragile. The first deportation started in March 1943 and ended in August. The Germans quickly deported around 60.000 people. Others could flee in the Italian occupation zones and got Christian papers, because there Jewish people were not so much persecuted and the Italians were not that much collaborating with Germans in that sense. One of this was Mr Alvo. I met him in Thessaloniki in the hotel Bristol; he is on the board that is running it. This hotel was a place where my grandfather, grandmother and my father and uncle lived in the 1950s and 60s thanks to the Jewish community, which was paying for his stay as well as for many other survivors who had nothing back in Greece. In this place people came that had lost everything. They had lost their family. Their house was expropriated. But some could also find some family members. On the other side the main problem was how you could live in Germany as a survivor right after the war? What was the resonance in Germany? Who are the ones you refer to or you talk to? That’s also why there was not a community, no points of reference there. My grandfather had around six Jewish friends that survived the concentration camp and of course they were all the time together. And then when the first generation of Gastarbeiter (guest workers) arrived to Germany, it became a different environment again, because in Germany there was still a predominantly fascist society. 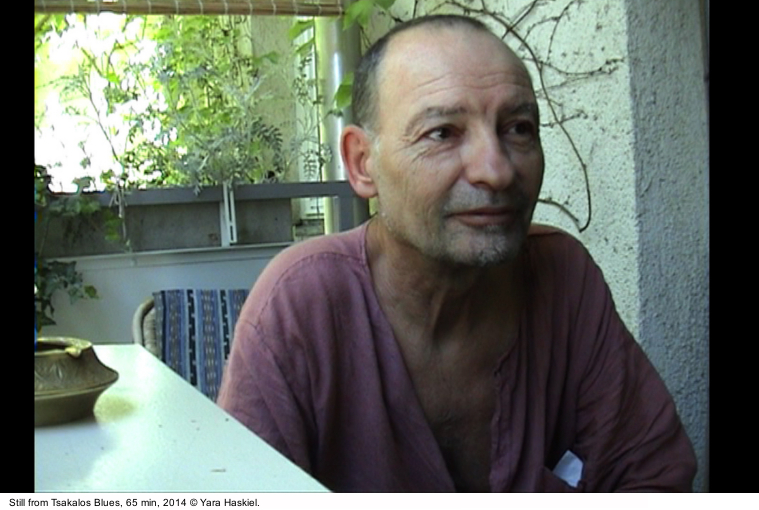 Mario Margani: So the survivors remaining in Germany had to elaborate this in private situations. There was not an open discussion on that, neither on the media nor with other people apart from other survivors. Maybe this was also a way to forget and start again something else. Yara Haskiel: There were the Nuremberg trials in November 1945 in Germany, The Auschwitz trials were held in Frankfurt, only in 1963. And yes of course, but he wanted also to protect his kids and avoid engaging in these dark stories while living in the German society at that time. Many survivors took decisions -suddenly and by chance. They fall in love with someone and followed him/her or one day something happened by chance, like having the opportunity to move, where there seem options to make a living. Others got papers to the U.S, Canada, or Israel, very few stayed in Germany. But it was of course also an issue of migration, policies, rules, regulations and the particular interests of the countries, where people applied for immigration. As you might know, survivors stayed in Displaced Person Camps that were located mostly at the former concentration camps for years (more concrete until the 1950ies), waiting for their immigration papers. Coming out from the camps they were in a very different mind-set and many took decisions without taking into consideration their long-term consequences. And some didn’t want to go back to Greece because once there they would have to join the military forces. My grandfather fell in love with my grandmother and the military service during the Civil War in Greece was discarded as a choice. Mario Margani: In the film your father tells about your grandmother words “You already experienced the concentrations camps, so it doesn’t make a sense to make another war in Greece”. How was for your grandfather to enter in relationship with a German Family after his experience of the camps? Did this tensions and experience had a reflection in the private life of your grandparents? In the film we see your father asking you about your mixed roots, being the granddaughter of a Greek-Jewish victim of the concentration camp on one hand and of German grandmother from that time on the other hand. 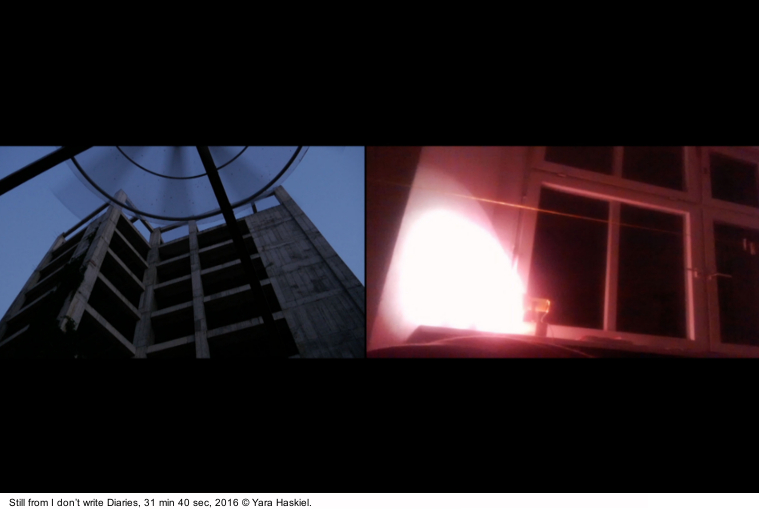 Yara Haskiel: While Tsakalos Blues develops you can see that the camera switches. My father starts to interview me. Somehow the positions got switched and in this particular moment when he asks me about my feelings in both being German and Jewish, and in this discrepancy, which would actually be normal. In posing that questions he refers to himself as well, who had a closest confrontation with this topic. This makes his way of asking a bit funny. In the case of my grandmother, she came from a very poor family and she grew up in her auntie’s house. They were rather social democrats and anti-fascist and she also grew up for some years in an orphanage. Of course since one was living as a youngster in that time you might get infiltrated by some prejudice and commonplaces connected to that ideology, but she was not coming from a fascist background. And my other grand cousins and aunties from her family were actually exactly these women considered like “dirt” from the German society in the Post-War times, because they were women who had married Americans or Italians and many were rejected by German mainstream society. Yara Haskiel: I used Krishnamurti precisely because my father told me about him. My father studied and read a lot about Hinduism, Buddhism, Meditation and Yoga, and many other things. But I think it corresponds somehow to the mind-set that he was using. He found there a way to reflect about himself in the world. He spread the message of personal in connection to global freedom from the material world and was very pacifist. It was a parallel to the hippie movement at that time. And the hippie movement, especially in Germany, was a counterpart movement to the 1968. It had a different attitude towards the world. The 1968 movement was very much dominated by people whose parents were considered accomplices in the Third Reich. It pains me a little bit when you ask me about my position in relation to my mixed identity. I made this movie also to find a way to display and show the ambivalences and precisely to go away from this notion of identity that fixes you to someone or to an idea. This is the repressive part of being fixed to an identity. I try to show that there are ways and strategies of surviving, moving differently and keeping our own hybrid identity. There is a specific intelligence that you develop if you are migrant or when you live or survived under certain circumstances. You develop other tools to navigate yourself through society. One of the major reasons why Krishnamurti is important and it was important to have him in the movie is because his words correspond to the mentality of my father in his work-refusal or not giving so much account to it. On the other end his articulation comes precisely from a very sub-proletarian thinking. When he was 14 years old he says he though about being a carpenter, a painter, or something else, not giving much importance to the employment. It is a specific articulation from a sub-proletarian perspective that later on becomes a manoeuvre in relation to labour in the hippie approach. Also my uncle was listening to Krishnamurti and following youth movements. He and my father lived and worked together in a kibbutz. But I think the reasons of my uncle refusing to deal with the story in relation to the movie or to really be part of the interview was that he has a lot of pain about these times. The times when they grow up there were a lot of fights and they grow up in a really violent environment with small Mafia-like or “Underworld” structure. And of course it is also about a different attitude towards my grandfather, because he was a figure. In the interview in Greece the Parente Brothers both talk about my grandfather as a tsakalos, a rascal and they make this big story out of his vicissitudes. But this vision of him reflects how they saw him when he came from Germany to visit Greece afterwards, with nice cloths and at the time when he made some money. Mario Margani: Your interview raises also the question of the gap between you and your father in dealing with certain topics, but also in the approach to life, which comes out throughout the whole film. You get often in front of the camera. Differences between you and your father’s views and moods come in foreground. There is a short passage where he tells to you: “We will never be in the first class”. This made me think about a sign of a frustrated ambition to reach a higher position in the society connected to common status symbols, which nowadays sounds obsolete. Later on he makes another quip with a similar approach when you both are filming the entrance of his childhood house and he tells to a current resident passing by: “Now I’m a famous artist, they are making a film about me, the television is here”. It always looks like that behind these jokes, even if he had a different, almost hippie approach, would still have an importance to reach some stereotypical and individualistic sign of success in life. As a failure, a tendency or an attempt, but still this approach looks to play a role in his life, despite his being sort of a borderline figure. Yara Haskiel: You can never reach to be bourgeois if you are not born into that. You will never reach that. Or it can become a desire that is constantly failing. But very simple, there was not this desire. To have a desire for a bourgeoisie background it is different than the desire to just be wealthy. It comes maybe from a different attitude, in Greece at that time. If I imagine my grandfather I think he had not a desire to be an intellectual or a bourgeois. Mario Margani: Didn’t your father want to become a musician? Yara Haskiel: He is a musician and of course he realizes that he will not be a big successful musician anymore. And he doesn’t really adore people going to the first class. But of course he would like to be able to have a more comfortable life with a higher pension and not having to work anymore in his age. Graduated in Communication and Management in Art and Cultural Markets (B.A.) and Arts, Heritages and Markets at IULM (Milan), Mario Margani is currently attending a M.A. in Global Art History at the Free University (Berlin). Since 2010 he lives in Berlin and collaborates with different project spaces, artists-run spaces, and other cultural institutions. 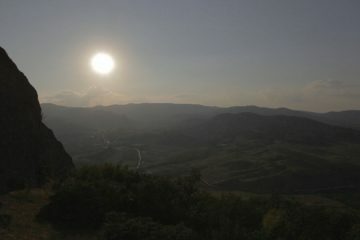 He is currently also starting a new collective project in his hometown Enna (Sicily) focusing on a multidisciplinary approach to cultural heritage.